Product #60589 | SKU 270600 | 0.0 (no ratings yet) Thanks for your rating! Includes a larger and more durable shoulder pad, lighter weight design, and an integrated kickstand for setting the rig down. 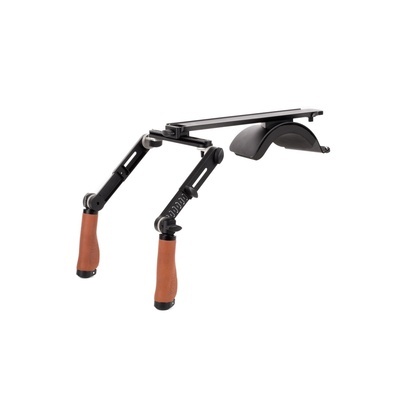 Now the Wooden Camera Shoulder Rig v3 (Pro, Leather) includes telescoping arms, additional arm rotation points to widen or narrow grip spacing, a larger and more durable shoulder pad, lighter weight design, and an integrated kickstand for setting the rig down. Quick release shoulder rig based on ARRI standard dovetail and rosettes. Arms that telescope from 11.5cm to 17cm. Allows for Crossbar to be adjusted left and right on the NATO standard rail by unlocking center thumbscrew and sliding. Threaded holes on Crossbar for attaching accessories like monitors, rod clamps, cheese plates, battery mounts, and more. Works great with our NATO Lock Ultra Arm Monitor Mount for quickly moving a monitor from camera to shoulder mounted position.